[They] should go to Nature in all singleness of heart, and walk with her laboriously and trustingly, having no other thoughts but how best to penetrate her meaning, and remember her instruction; rejecting nothing, selecting nothing, and scorning nothing; believing all things to be right and good, and rejoicing always in the truth. 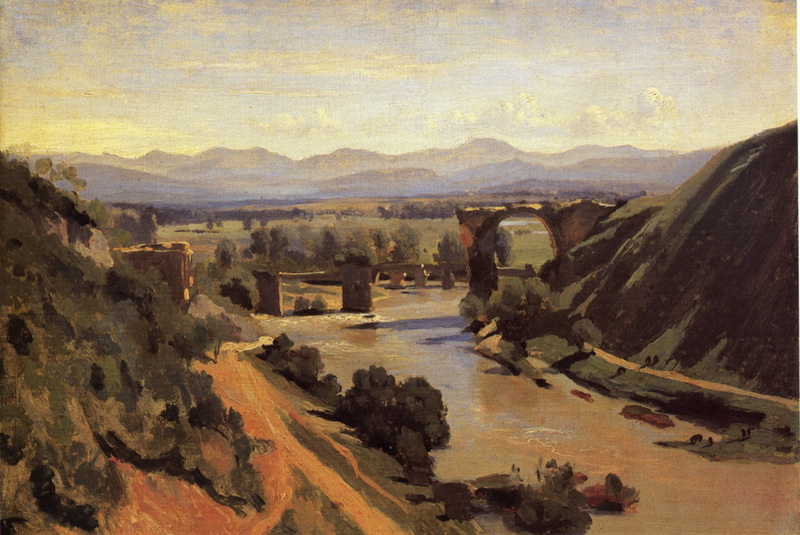 What could perhaps have been a manifesto for Impressionism, or the plein air painter’s principles, turns out to have been written by John Ruskin, at the end of his first volume of his book Modern Painters. It ignited the flame of the Pre-Raphaelites, whose landscape paintings had been largely forgotten until recently. This is the first in a series of articles in which I will consider mid- and late-nineteenth century realist landscape painting, from the Pre-Raphaelites on – what and why it was, and what it achieved. Advice, which, whether bad or good, involved infinite labour and humiliation in the following it, and was therefore, for the most part, rejected. Although by 1851, when Ruskin wrote his pamphlet, the Pre-Raphaelite Brotherhood (PRB) and its followers had produced and exhibited some key works, few (if any, at that stage) were pure landscape paintings. Many of their narrative and other works had landscape backgrounds, but it is always difficult to assess a background when it is subjugate to the figures and the story that they tell. 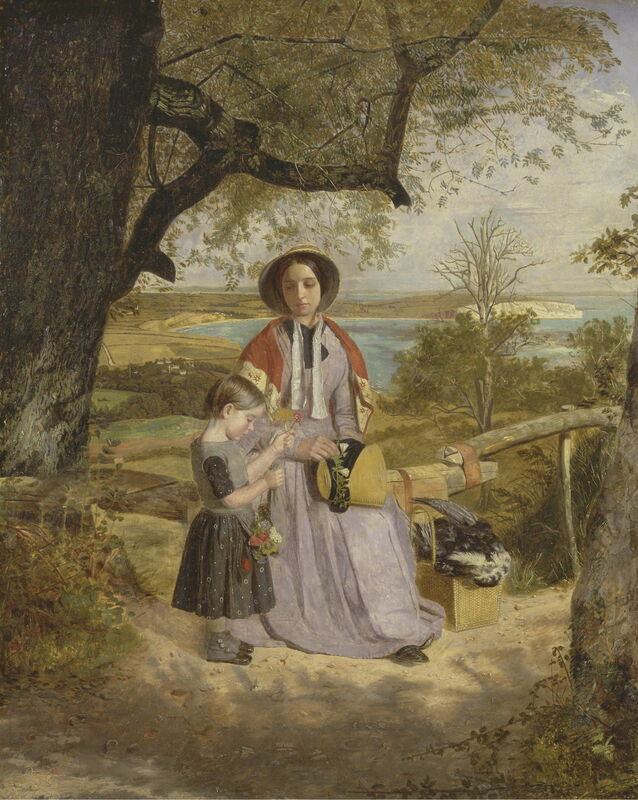 James Collinson, one of the less well-known members of the PRB, had painted his Mother and Child by a Stile, with Culver Cliff, Isle of Wight, in the Distance in about 1850, and with him was probably Richard Burchett (not a member of the PRB), who painted his View Across Sandown Bay, Isle of Wight (below) from nearby, almost certainly during the same visit. Of the two, it is Burchett’s painting which comes closer to what evolved into the pure Pre-Raphaelite landscape, with its fine detail and high chroma. 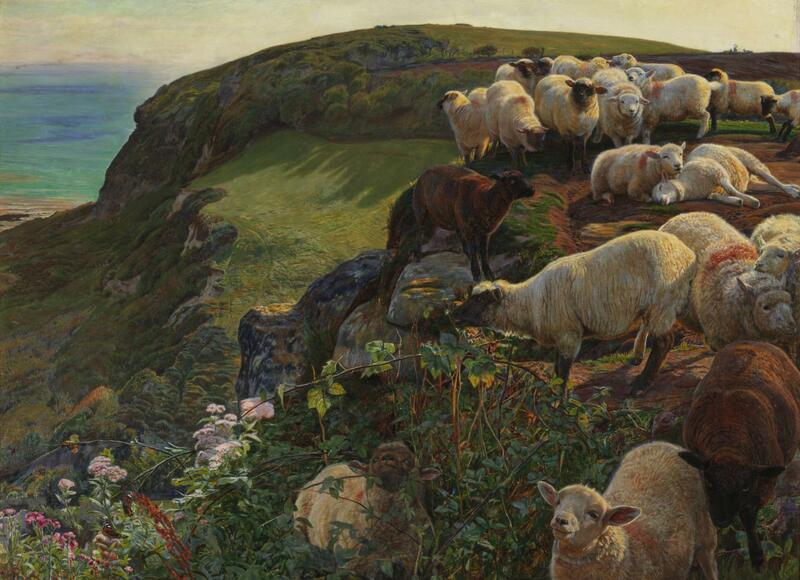 After them, the next candidates are both coastal landscapes featuring sheep: Ford Madox Brown‘s Pretty Baa-Lambs, which was first painted in 1851 and modified in 1859, and William Holman Hunt‘s Our English Coasts, 1852 (popular known as Strayed Sheep) of 1852. Holman Hunt was a member of the PRB, but Ford Madox Brown was not. 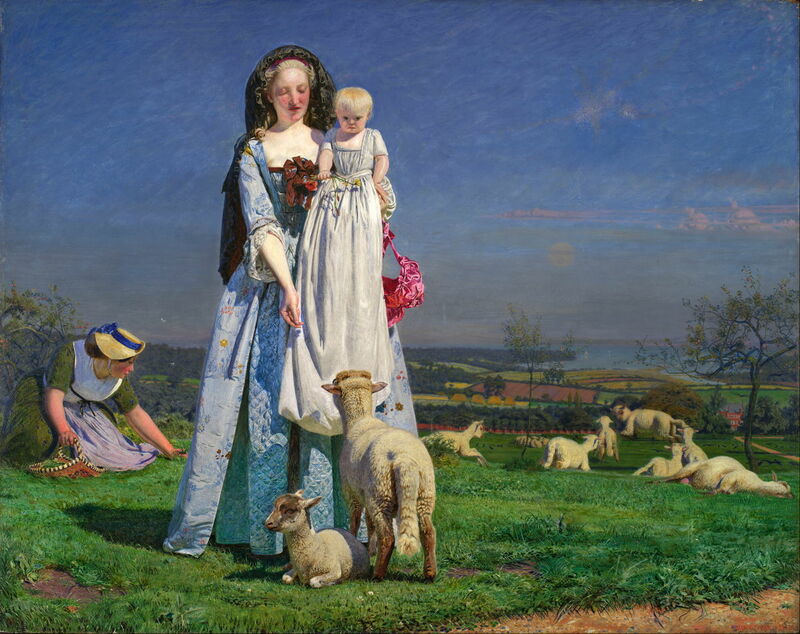 Despite its insipid title, and the dominance of the mother carrying her infant, Pretty Baa-Lambs contains a wealth of very precise detail, and uses bright, high chroma colours. 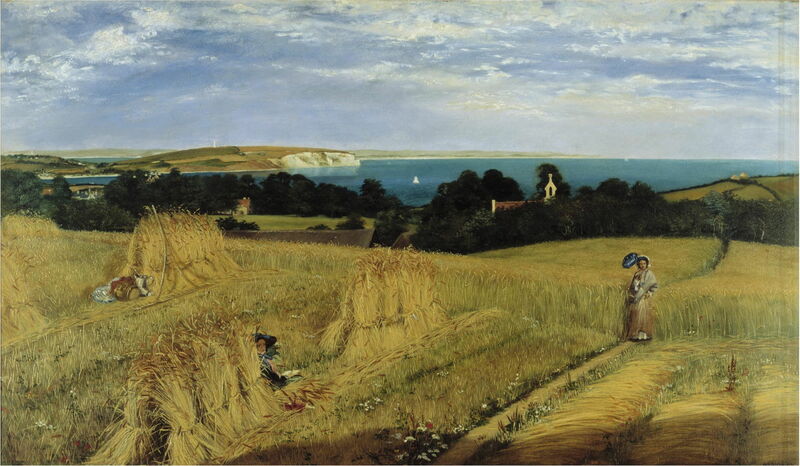 Holman Hunt’s Our English Coasts, 1852 is pure landscape, with exceptional attention to detail. Authors are keen to point out that he even depicted the backlit blood vessels in the nearest sheep’s ears, and that level of meticulous detail extends throughout the canvas. Again, it is rich in high chroma colour. 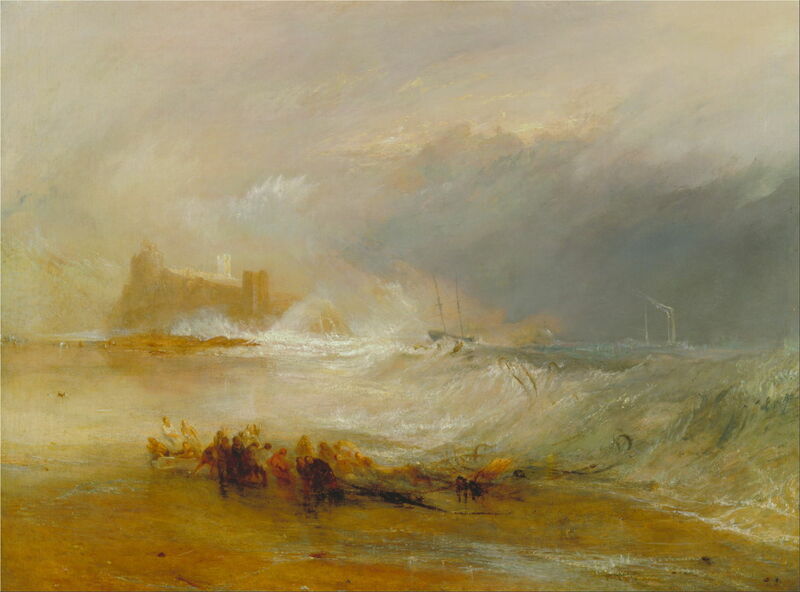 These contrast with the plein air sketches which had become popular among painters visiting the Roman campagna during the previous century, and were very different from JMW Turner’s landscapes of that late period. Given that much of Ruskin’s first volume of Modern Painters was aesthetic support for Turner’s work, it is interesting (and perhaps puzzling) that the Pre-Raphaelite response was so different. It was, however, entirely consistent with the more general principles of Pre-Raphaelite painting. Here lies the first of the problems with Pre-Raphaelite landscape painting: it bears no resemblance to the few landscapes which were painted before Raphael ‘changed the direction of art’ (as was the basis for the PRB), nor does it have any common ideals. Here for instance is Masaccio’s brilliant landscape background to The Tribute Money fresco in the Brancacci Chapel, from 1425-28. 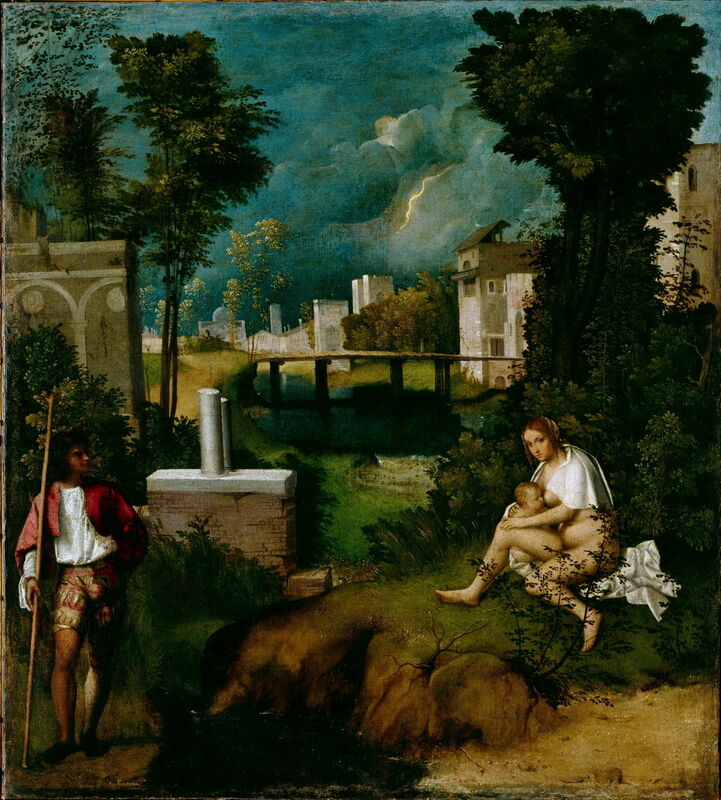 Among the first real landscape paintings was Giorgione’s The Tempest, from eighty years later. So what emerged as Pre-Raphaelite landscape painting was not derived from the little landscape painting practised before Raphael, nor from its contemporaries such as JMW Turner (despite Ruskin’s extensive praise of Turner’s landscapes), nor even from the hundreds of pages of different truths and principles laid down by Ruskin. It was a meticulously detailed realism attempting to depict what was actually present in nature, usually using high chroma. The next article will consider how true it was to nature. Posted in General, Painting and tagged Brown, Burchett, Collinson, Hunt, landscape, painting, PRB, Pre-Raphaelite, Ruskin, Turner. Bookmark the permalink.